The rose ‘Sterling Silver’ is well known to rosarians and non-rosarians alike. 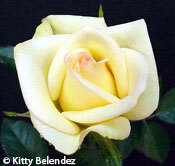 Its rating of 5.1 is among the lowest in the ARS Handbook for Selecting Roses. Yet it is one of the few roses known by name to members of the general public. In part, this is because of its pleasing lavender color, exceptional form and powerful fragrance. Such observations, however, if repeated in an online forum seem to invariably produce a peculiar response. Someone – typically a person who has never before contributed to the discussion – will surface and declare this assessment of the known faults of ‘Sterling Silver’ to be untrue and thereafter describe in detail the ‘Sterling Silver’ that she grows – a prodigious plant producing dozens – nay hundreds - of blooms annually, all on a vigorous, disease-resistant bush, certainly one of the most wonderful in her yard. Mind you, in 40 years of growing roses I have never actually seen one of these mythical bushes (nor for that matter have I seen a unicorn) but I have seen numerous testimonies to its existence. Another peculiarity may also often be found at the local flower shop where a florist when asked for a ‘Sterling Silver’ rose will produce whatever mauve rose with fragrance that happens to be in inventory and solemnly declare it to be ‘Sterling Silver’. This will occur despite the fact that few if any wholesale rose producers actually offer ‘Sterling Sterling’ (this because it will not grow for them either). The enduring popularity of ‘Sterling Silver’ – and its myth – relates no doubt also to its name. For some reason there is a very positive association of silver with a rose. I do not know the psychology of this and will leave that to the reader to ponder. Instead, in this article I have in mind another connection between silver and roses, specifically the use of silver in the preservation of cut rose blooms. It is a matter of common observation that cut rose blooms change as they age. The rose opens, the blooms wilt, the petals lose substance and they eventually fall off. The aging of blooms whether cut or still on the stem is called “senescence”, from the Latin word senescere “to grow old” from which English words such as “senile” are also derived. Additional studies have shown that treatment of cut roses with silver thiosulfate (STS) inhibits the effects of ethylene gas by blocking the action of ethylene in plant cell cultures. Other studies have shown that silver nitrate also blocks the action of ethylene but is not transported as well as STS. As a rose exhibitor interested in the preservation of cut blooms for a show I have had occasion to examine these studies to determine if there are any implications for the preservation of show quality blooms. A close examination of the studies has indicated that there are none of importance. First, the studies generally demonstrate that in roses STS has no effect on vase life unless ethylene is applied exogenously, i.e. from an external source. Protection of show roses from external sources of ethylene is relatively simple through refrigeration and storage outside of the presence of ethylene gas such as auto exhaust or ripening fruit. Second, the increased vase life shown through the use of STS is relatively trivial. 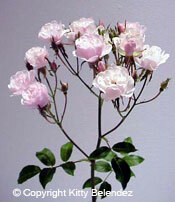 For example, one study produced a vase life of 6 to 7 days compared to 4 days for untreated roses. Finally, and most importantly, the additional vase life was obtained by delaying the final wilting of the bloom – basically adding a few days on to the end of the bloom. To a rose judge an old bloom is an old bloom and the fact that the old bloom might hang on to its petals for a few days after the show is over is of no importance. A new and more promising area of inquiry focuses on the known antibacterial properties of silver. Bacteria represent a much greater threat to the preservation of cut roses than ethylene gas. Bacteria clog rose stems and cause a break down in the vascular structure of the cut rose. Bacterial growth is retarded by refrigeration as well as antibacterial agents in commercial rose preservatives. Silver is highly toxic to bacteria. While silver’s importance as a bactericide has been documented only since the late 1800s, its use in purification has been known throughout history. Early records indicate that the Phoenicians, for example, used silver vessels to keep water, wine and vinegar pure during their long voyages. In America, pioneers moving west put silver and copper coins in their water barrels to keep them clean. In fact, there are some who believe that the phrase “born with a silver spoon in his mouth” is not a reference to wealth, but to health. In the early 18th century, babies who were fed with silver spoons were thought to be healthier than those fed with spoons made from other metals, and silver pacifiers found wide use in America perhaps because of their beneficial health effects. Although it has been known for centuries that silver kills germs, scientists have only recently discovered how. In particular, scientists had puzzled why silver is harmful to bacteria but not to humans. More recent studies have shown that silver interrupts the ability of bacteria cells to form chemical bonds essential to bacteria’s survival. These bonds produce the cell’s physical structure, so bacteria essentially falls apart in the presence of silver. By contrast, cells in animals and plants typically have thick walls that are not affected by silver. Even more recent studies have shown that the toxicity of silver to bacteria is accentuated when silver is delivered by a nanoparticle. For those unfamiliar with that term, a “nanoparticle” is a particle that is less than 100 nanometers. A nanometer is one billionth of a meter and there are 25,400,000 nanometers in an inch. A nanoparticle is therefore a really, really small particle. And, it has been generally found that nano-sized materials or nanomaterials can have fundamentally different physical properties than their larger-sized counterparts, and these differences often enable nanoscale materials to be used in new and valuable ways. Having been aware of the growing development of nanotechnology as well as the use of silver to preserve cut flowers, I was therefore fascinated to read in the column on Recent Rose Research in the January/February 2011 issue of the American Rose of a study by five Chinese researchers titled “Nano-silver pulse treatments improve water relations of cut rose cv. Movie Star flowers”. The study itself appeared in a recent issue of the scientific publication Postharvest Biology and Technology. According to the abstract of the article, the vase life of cut roses of the variety ‘Movie Star’ (a variety otherwise unknown to me) when placed in deionized water was normally only 9 to 10 days regardless of maturity at harvest. However, when those flowers were placed in a nanosilver base solution for 24 hours and then kept in a low concentration nanosilver solution, the vase life of the cut rose flowers was prolonged by 11.8 days. Further examination revealed that the silver solution not only alleviated and delayed vascular blockage caused by bacterial contaminations but also inhibited stomatal conductance so that the water balance in cut roses was significantly improved. Put simply, the vase life of roses treated with a nanosilver solution was extended from about 9 days to over 20 days, primarily because the silver inhibited bacterial contamination. “Hmmm” – I thought – “adding nearly 12 days of vase life to a cut rose is a long time.” And so I wondered if perhaps such results might be replicated so as to preserve for perhaps a few days more the roses I cut. The implications would include possible preserving roses for exhibition or use in arrangements or just making those roses cut for the house – or a friend – last longer. Reading further to determine exactly what nanosilver solution was used I learned that treatment used 10 mg per liter nanosilver plus 5% sucrose solution for 24 hours followed by holding samples in 0.5 mg per liter plus 2% sucrose solution. Sucrose is a sugar solution added as a nutrient and is also commonly used in floral preservatives. My next question was where to find nanosilver particles to try this at home. Researching the subject online, I learned that another name for nanosilver is colloidal silver. Colloidal silver is a solution of water containing nanometer-sized particles of suspended silver. The total silver content is expressed as milligrams of silver per liter (mg/L) of water which is numerically the same as parts per million (ppm). I also learned that silver nanoparticles do not remain “nanosize” when they come in contact with normal environmental samples, such as soil and water, but they agglomerate to form much larger, much less biologically effective, silver particles that are non-toxic, non-ionic and have no history of being harmful to the environment or aquatic life. Purest Colloids produces colloidal silver and other colloidal metals. In addition to their flagship product, MesoSilver® brand colloidal silver, they offer other metal colloid products for use as dietary supplements. Determining whether or not colloidal silver has health benefits as a dietary supplement was not the purpose of my inquiry and I have no opinion on that subject. Instead, I was looking for a product that was similar to the nanosilver solution used in the study on the preservation of cut roses. With this in mind, I focused on another product in the line offered by Purest Colloids called Hot Tub Silver™. Hot Tub Silver is a very concentrated form of colloidal silver containing approximately 200 ppm total silver that is added when the water in a hot tub is changed. The silver particles kill bacteria and fungus on contact and prevent algae growth between water changes. As a result, the water stays crystal clear and free of chemical odors. One 500 mL (16.9 Oz.) bottle costs $60 including shipping and will treat a hot tub up to 440 gallon capacity. At first glance $60 appears a little pricey for a floral preservative but assuming it will treat 440 gallons of solution as in a hot tub, that works out to 13.6 cents/gallon, which compares favorably with Floralife that is advertised online in packets that cost 44 cents/gallon. Further to a rose exhibitor – if it were to make the difference between a wilted and winning entry, it would be worth it. I have purchased a bottle of Hot Tub Silver and my experiments are underway. I am no scientist and am not undertaking controlled tests with blinds and comparisons and the like. Instead, I am simply trying it to see if it works with cut roses. To do this, I have mixed up batches of Hot Tub Silver at the rate of 1/4 teaspoon/gallon and have been placing cut stems directly in them for a period of time after cutting to kill the bacteria. Thereafter I have refrigerated the roses in the same solution. It is interesting to examine the Hot Tub Silver solution, which remains crystal clear for days after and suggests it is doing its job in killing bacteria. Is this going to work? I don’t know. Dona and I took a lot of roses to the San Diego show that had been placed in a solution of Hot Tub Silver and we did very well. Then again, we often do well at rose shows and most of those roses were cut a day or two before the show anyway. Consequently, I don’t really have a sense yet of whether this treatment has helped with the show quality of blooms. On the other hand, a number of the roses we took to the show were not entered for one reason or the other, and these were brought home and kept in the silver solution. Here the water continued to remain crystal clear and it was also clear to me that the roses in the solution have held much better than in the past. So, yes, preliminary results do indicate that Hot Tub Silver can increase the vase life of cut roses. It remains to be seen if Hot Tub Silver will be my newest recommendation for preserving cut roses for the show. But there are a few things I do know. First, Hot Tub Silver does work in keeping water clear and preserving cut roses. At the same time it is unlikely that anyone using Hot Tub Silver will ever get a stem of ‘Sterling Silver’ to last for 21 days. Finally, there is probably someone who will read this and write to tell me that their wonderful blooms of ‘Sterling Silver’ routinely last that long. I’ll believe that when I find a unicorn in a hot tub. © Copyright Robert B. Martin, Jr. All rights reserved. Published with permission.